Before he passed on, Johnny Carson was one of the most famous television icons. He was the host in Nighttime Show, and he earned NBC many viewers with his easy way with people. 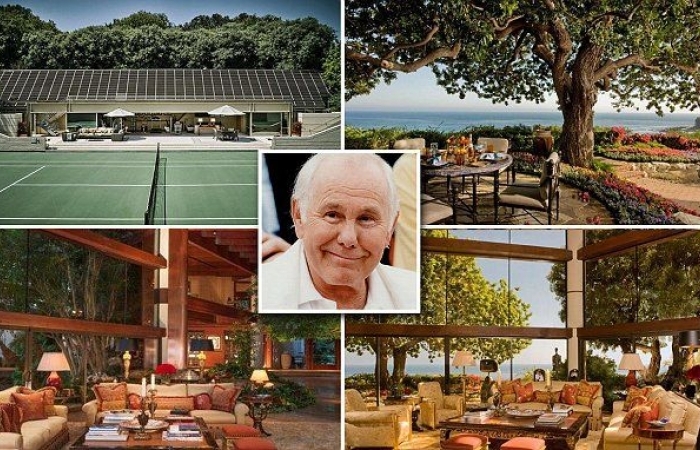 He owned a four-acre Malibu Estate which was built in 1978, and he purchased it in the 1980s. After his sad departure, Sidney Kimmel who is a film producer and his wife, repurchased the house in 2017, for which they paid $46 million. They did not make any significant changes, and therefore its original design is still intact. The house, though built in the 1970s, has a late modern design highlighted by the high ceilings and cavernous spaces. The interior of his home has almost a similar look with that of the showroom of the Tonight Show. Besides the ferns and vines falling gracefully on the floor from the massive windows, is a fully grown tree in the living room. Before we get into the inside, a quick peek on the outside will provide us with a sight of some of the fantastic features of the property. To begin with is the favorite place of the late star; the tennis court. This was not any other tennis court but a championship court which was installed for him by NBC as a retirement gift. Just as was and still is known to many people, Carson was not one who entertained many visitors, however, when you had your way with tennis, then getting a pass in was not hard. Amazingly, the property also had a cascading waterfall which provided to die for the scene. Additionally, still on the outside, were a Koi pond and saltwater pool. Enough of the outside. Now the Malibu home’s living room has high ceiling glasses and a stone floor, with sky-high windows that allowed in natural light. It also has an indoor arboretum. However, one thing that will catch your attention is the glass copper fireplace placed at a strategically conspicuous place in the room. Surprisingly, the massive Malibu house only had one bedroom, and in case of visitors, they would use the guest rooms on the opposite side of the street. The master bedroom had two bathrooms and two dressing rooms. Amusingly, the master suite alone covered the whole of the second floor. Additionally, the house also had a study/office which had almost three variety of chairs in different parts of the room, a magnificent study table, and two stools; also of a different make. Another remarkable fact about the place is that it’s glass ceilings filters in light in funny yet beautiful patterns. Also, the house has an exercise pavilion that opens directly to the outdoors. If you are ever looking to spruce up your home's decor, and a koi pond isn't quite in the budget, we suggest you visit Pier 1 for some great ideas and deals on home decor.